A (Meng Hai) Meng Song tea from a small ancient tea tree garden on Hua Zhu Liang Zi. The leaves are sinensis assamica but appear relatively small, which is likely due to a combination of altitude,soil type and the surrounding forest environment. 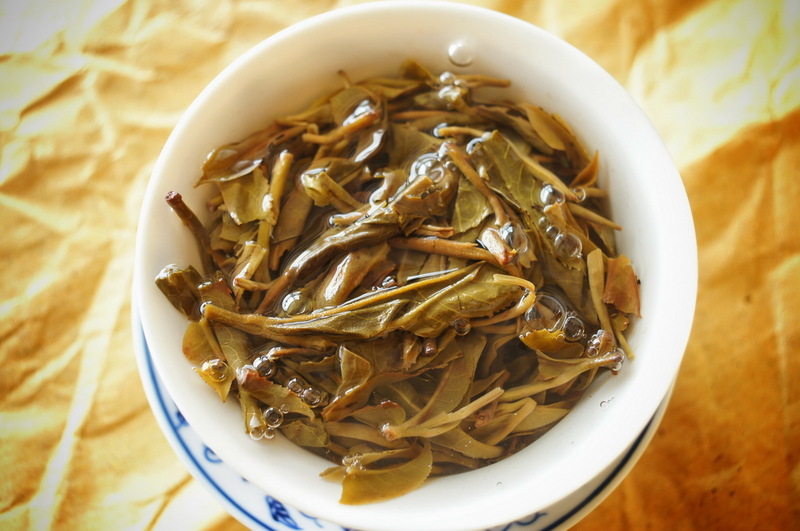 As seems to be common in Meng Song teas, the initial impression is one of a mild mannered tea – the rukou is gentle, the broth produces a slight oiliness and there is the floral fragrance that Meng Song is known for. The hui gan is good and brings along with it a cooling sensation in the mouth and throat. The thickness in the flavour is also not initially of note, and arrives later. There is a very slight hu wei in the first couple of steeps, but by the end of the second gai wan it has disappeared, leaving a sweet, floral impression with a slight lingering bitterness. Generally, this tea has a pleasing fragrance, a smooth kou gan and a good hui gan with some hou du. It lasts well – after 2 kettles of water the tea is still holding up well. A good example of a Meng Song tea. Cakes are 498RMB . Samples are free of charge, but postage will need to be paid.